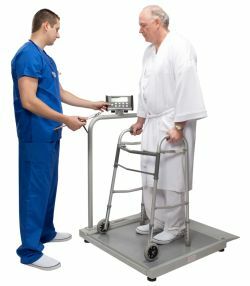 The Health O Meter 2500KL wheelchair scale has a capacity of 1,000 lbs and a readability of 0.2 lb with a base size of 29-3/8 x 28-1/4". The Health O Meter 2500KL digital wheelchair scale is a cost effective solution for weighing standard width wheelchair patients. 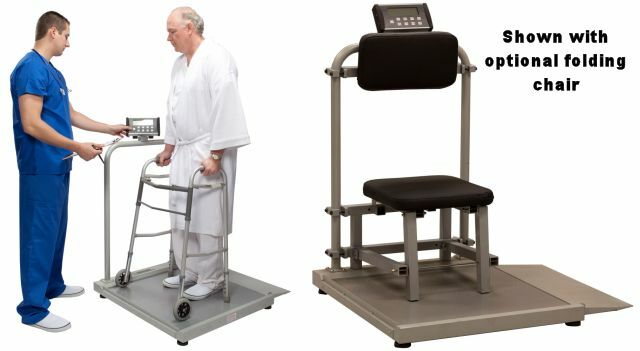 This scale comes with a handrail so you can weigh ambulatory patients with walkers as well as wheelchair bound ones, additionally the 2500KL can be fitted with the optional CHAIRACC fold away chair attachment. The scale has two wheels and two handles on the opposite side to facilitate moving the scale to a new location (handrail is fixed), and has a single ramp to the platform. The 2500KL indicator has USB connectivity and has the ability to connect to EMR software and can also determine the patients BMI. The indicator also swivels up to 180 degrees for easy viewing by the operator.